SUNSHINE HERO at THE FLAG OF PEACE, RISING YOU UP to the TROPOSPHERE giving you an ELECTROGASM. 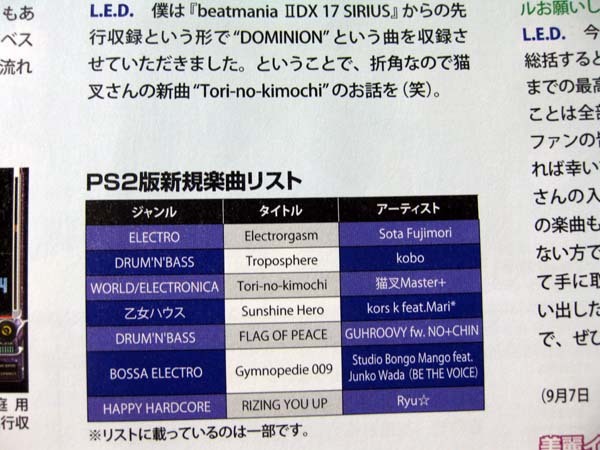 Are they giving DOMINION for IIDX 17 example? Instant buy. DOMINION is one of the best L.E.Ds song so far. Theyre COMMING! The Peviews are COMMING!! Aww, they removed the extra "M" now. Well, while they are still COM(M)ING SOON, I'm banking on Tori-no-Kimochi and RIZING YOU UP being totally amazing. Some of the peviews are now watchable. tori-no-kimochi doesn't sound like Nekomata+ at all (more like regular Nekomata) which leads me to think that later in the song something crazy will happen. Electrorgasm sounds like oldschool good-cool. Troposphere sounds quite nice as well. Thank you for your order #(number). preorders for beatmania IIDX 16 Empress + Premium Best (Special Edition). Order from another place. I got my LE CS Happy Sky from Himeya but Himeya's not the only place that sells them, so... Keep Try. Also, lots of people like to sell extras after they get them in, so check ebay and marketplace forums and the like, you might be able to find one there, though you'll probably pay a few extra bucks. I guess that just depends on how bad you want it. No, no, no, I think you missed my point. Theres three versions of the limited edition bundle - but the aside from the cheapest one, the only additional items in the more pricey bundles is music cds or video cds. Both are generally items i couldn't care the less for, so I'd basically be buying something I normally wouldn't purchase. Thus, for me, its generally either the cheapest LE, or none at all. Which brings me to my other problem: most places I've seen online generally don't offer the cheapest LE bundle. They may offer the medium priced one or most expensive one, but generally not the cheapest one. Let me put it another way: if I get just the game, it'll run around $85 + $5 shipping. If I have to pay double this (e.g. $170) or more, then I figure I'm officially a lunatic, and won't bother buying it since it'd be a large amount to plop down for a single game. EDIT: I don't remember if I said it in the thread, but I did get Happy Sky LE. I was... fairly disappointed with its contents, so thats my main un-motivation for your "Keep Try" motivation. Well then at this point I can't help you. - I won't use most of the stuff anyways. - Since it'll probably move to another console _which I don't have yet_, I should probably keep the savings ($50 difference or so) and put that towards the next console (and possibly controller) it's released for. Well, if I had the money, I'd be getting it just for the amazing box. But, I haven't gotten a IIDX game since Happy Sky, so I'm due for a new one anyway. Bad Maniacs is in, amazingly enough. HST, do you know if Pabst Blue Ribbon has a black chart?